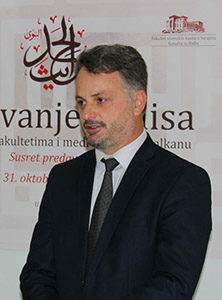 Omer Halil Kajoshaj, born on 1972 in Podgorica Montenegro, is the Director of Foreign Relations Department, Islamic Community in Montenegro and the Chairman of the NGO, Horizoti – Center for Cross Cultural Understanding. A graduate of the International Islamic University Malaysia, Department of Communication, currently obtaining master’s degree on journalism, University of Montenegro. Published several articles on religion, society and politics in local and foreign newspapers.